Ana Mardoll's Ramblings: Author Interview: Jan Hurst-Nicholson on "But You Can You Drink the Water?" Author Interview: Jan Hurst-Nicholson on "But You Can You Drink the Water?" Ana: Jan, an excerpt from your novel “But Can You Drink the Water?” was submitted in the ABNA 2010 contest. You introduced us to a modern family of three - Frank, Mavis, and Gerry - as they prepared to move to Africa for a five-year career opportunity. I remember being so impressed with the delightfully dry British wit you brought to the prose - Frank is absolutely gob-smacked that his long-suffering wife and world-weary teenage son aren’t thrilled with the prospect of their surprise emigration. Can you tell us more about your novel and where it goes from the end of the excerpt? What sorts of themes do you explore and what do you hope the reader will take away from the experience? Jan: The book actually began as a sitcom. A local film producer was interested and asked for one full episode and synopses for 20 more. Unfortunately the SABC decided to drop freelance production, so nothing came of it. But I had all these characters and situations still buzzing in my head trying to get out, so I turned the episodes into a novel. I probably would have approached it differently and perhaps given the story more depth if I had started writing it as a novel, but as it was a sitcom I had concentrated on the humorous situations and dialogue. It is very much 'British humour' which depends on a shared background and recognition of the characters. The title "But Can You Drink The Water?" is a familiar phrase to British readers, but possibly less so to US readers. The excerpt consisted of the first two chapters, seeing the Turners arrive in Durban. The bewildered working-class scousers are soon thrust into an alien world of servants, strange African customs, unintelligible accents, and unexpected wild life (‘crocodiles’ on the wall). Their uneasy interactions with Zulu servants, Afrikaner neighbours, and foreign officialdom exposes their naivety, but they each learn to cope in their own individual way; Mavis overcoming homesickness by hugging the knowledge that when Frank’s contract ends they can return home; Gerry’s sullen resentment giving way to love of the outdoor life, and Frank masking his own doubts with blustering optimism and bantering sarcasm. Having overcome culture shock, the arrival of Mavis’s parents introduces a divided loyalty when Gert and Walter’s National Health glasses and ill-fitting dentures are seen through the eyes of the Turner’s new South African friends. And when Mavis’s sister ‘our Treesa’ and her opinionated husband Clive visit, Mavis surprises herself by hotly defending SA. The story follows the upsets, hurt and changing family dynamics that emigration brings, and has an underlying theme of: ‘Is home more than where the heart is?’ Expat reviewers have recognized the truths in the story and related to the situations, also discovering on returning home for a holiday that they no longer belong 'back home' and no one wants to hear their stories or look at their photos. Perhaps the book will serve as a caveat to future expats! Ana: I love how you've combined light humor with something so fundamentally deep and profound - I know from my own expat friends that disorientation you describe of belonging in two places at once and yet neither completely. What was your inspiration when writing your novel? Were you influenced by a specific author or work that inspired you to add your voice to this genre? Jan: I drew (very loosely - I was single when I arrived in South Africa and I met my husband here) on my own experiences and those of fellow expats. Immersing into a new and often very different culture can be traumatic, especially for the spouse left at home to cope on her own while the husband quickly adapts to a new working life. I was probably influenced by ‘slice of life’ books, such as ‘The Grass is Always Greener Over the Septic Tank ’ by Erma Bombeck, and ‘The Best of Father’s Day’ by Hunter Davies. The older British sitcoms - Dad’s Army , Till Death Do Us Part , and Steptoe and Son may also have played a part. Monica Dickens however, has been the biggest influence on my writing ‘voice’. A writing friend once advised that if I wanted to learn about characterization I should read Monica Dickens. I read ‘The Fancy’ and was hooked on her books. Ana: I'm a big fan of Erma Bombeck, and I can definitely see the connection - she has a great way of combining humor and melancholy. I'll have to check out those sit-coms! When I first read the excerpt for “But Can You Drink the Water?”, I was impressed at how well you struck a balance when characterizing the family members: they’re all intensely realistic and they start off rather unsympathetic, but even in the short time we saw them in the excerpt, they became profoundly more vulnerable and likable - almost as though the reader was seeing themselves in your fictional family. If you could compare your novel to any other existing work, which one would it be and why? Jan: This wasn’t my first book. I started out writing articles, humorous articles and short stories, and then went on to write "The Breadwinners ", a family saga set in South Africa. Although this was runner-up in the SA Writers’ Circle novel competition I couldn’t find a publisher. My next project was "But Can You Drink The Water?" which was a runner-up in the Peter Pook novel comp in the UK, but also no publishing contract. I then started writing children’s books and my first book "Leon Chameleon PI and the Case of the Missing Canary Eggs" was published by Gecko Books. This was followed by "Leon Chameleon PI and the Case of the Kidnapped Mouse". These are humorous, animal detective stories for 7 - 12 year olds. Penguin published "Bheki and the Magic Light", and "Jake" was published by Cambridge University Press. My YA novel "Mystery at Ocean Drive ", a Hardy Boys-type action adventure story, was also a runner-up, this time in the 2010 Citizen/Pan MacMillan YA novel competition, but again no contract. After overhearing bookshop customers looking for ‘something to read on the plane’ I put together a collection of my humorous articles and short stories, added some more fun stuff and self-published it under the title "Something to Read on the Plane ". This is selling well at local airports, but unfortunately it is difficult to find a distributor for the overseas market. Jan: It was FREE to enter, and there was the opportunity for the book to be read by a publisher. The promise of a Publishers Weekly review for the semi-finalists was also a big plus. I didn’t expect to get into the finals as my book is light-hearted and without the ‘depth’ that judges often look for, but I enjoyed the camaraderie of the ABNA threads and was thrilled to reach the semi-finals. 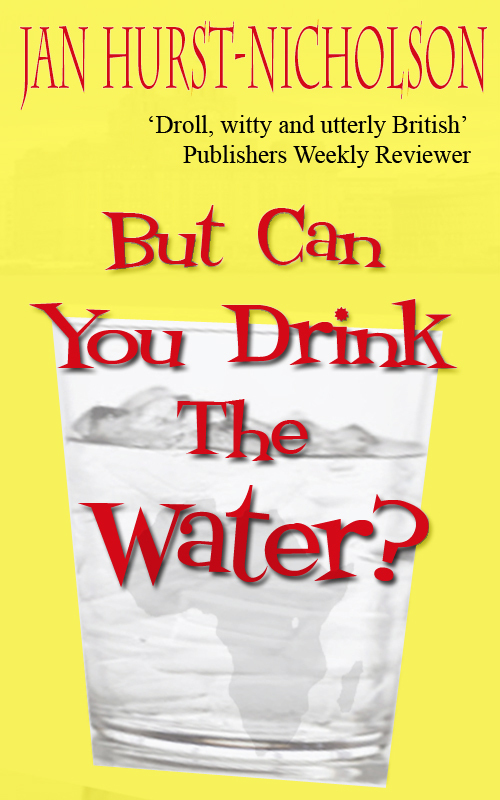 My Publishers Weekly review gave me the confidence to e-publish "But Can You Drink The Water? " and ironically it has already sold over 7000 copies while the ABNA winner will have to wait until next year to see the book in print. Ana: Wow, that *is* irony - I'm so glad it turned out so well. Where can readers obtain a copy of your novel for them to enjoy? "But Can You Drink The Water?" "Something to Read on the Plane"
"Leon Chameleon PI and the Case of the Kidnapped Mouse"
The books are $0.99 except for "Leon" which is $2.99 (have to share royalties with the publisher and illustrator). Ana: Jan, thank you so very much for being willing to participate in this guest blog interview. Is there anything else you’d like to add? Jan: I’d like to thank you for posting your original review of my excerpt, and for offering the opportunity for this interview, and to also thank the many readers who have bought my books. E-books have certainly changed the publishing world. Both "The Breadwinners" and "But Can You Drink The Water?" were written over 20 years ago. Publishers liked them, but said they were not ‘commercially viable’, yet "But Can You Drink The Water?" has reached #20 in the Amazon UK top #100 bestseller list, and was #1 in three categories for several weeks. Without the gatekeeper agents and publishers it is the readers who are now deciding which books are worth reading. Many traditionally published authors are also seeing the advantages of being in control of their own books through e-publishing. The cheaper e-book prices are encouraging readers to try new authors and genres, and books are being devoured at a rapid rate. This is mutually beneficial (except perhaps for the traditional publishers). In countries with a small reading public, such as South Africa, e-publishing has now afforded the opportunity of a global readership. Jan, you're very welcome - I am grateful to all the Indie authors I've met - it's such a wonderful world of new, original ideas and fresh, clear voices!